Inez Wisdom and her companion Gertrude Griffith had admired the small family chapels that they came across on their European travels. When Dr. Wisdom’s patients, unable to pay their doctor bills with cash, requested options, she suggested they could help her to build a small chapel. With the help of these patients, local artisans and craftsmen, the small white stucco, brown shingled St. Francis Chapel seating 12-15 people was built. Within the chapel, John Maxon, a student artist at the University of Michigan painted the unique al secco fresco of the Transfiguration behind the altar. In 1952, Inez Wisdom, donated part of her land and the St. Francis Chapel to the newly designated St. Clare of Assisi Episcopal mission church in southeast Ann Arbor. 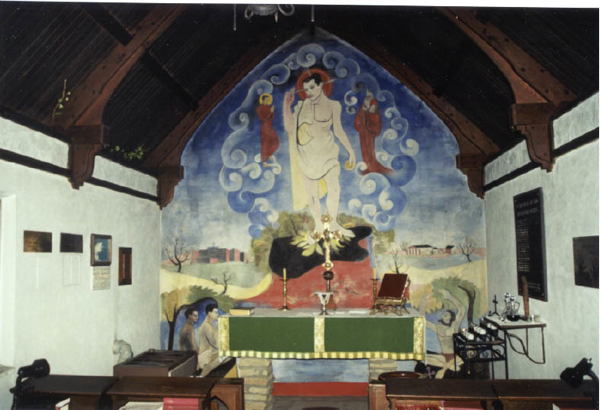 The Transfiguration fresco painted by John Maxon stands behind the chapel altar On May 24, 1953, the first service of St. Clare of Assisi was held in the Chapel. The Rev. Philip Schenk, a retired University of Michigan professor and Greek scholar, came out of retirement to serve the mission without pay. 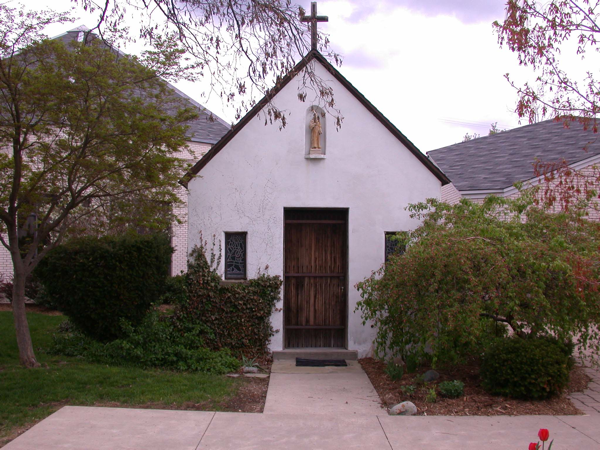 Because the chapel was far too small for the congregation, with substantial help from the Diocese of Michigan, in 1956 the first sanctuary building was erected next to the St. Francis Chapel. Plaque commemorating the building of St. Clare’s first sanctuary From the beginning, parishioners were diverse in their backgrounds, with St. Clare’s becoming a spiritual home for lifelong Episcopalians as well as those with no current affiliation with an organized religion. In 1957, the Reverend Albert Neilson came to St. Clare’s mission to assist Reverand Schenk, and, in 1958 became vicar. The 1960s were years of continued growth for St. Clare’s. The Rev. Colin Campbell came to St. Clare’s in 1963, and served first as Vicar and then as rector until 1972. 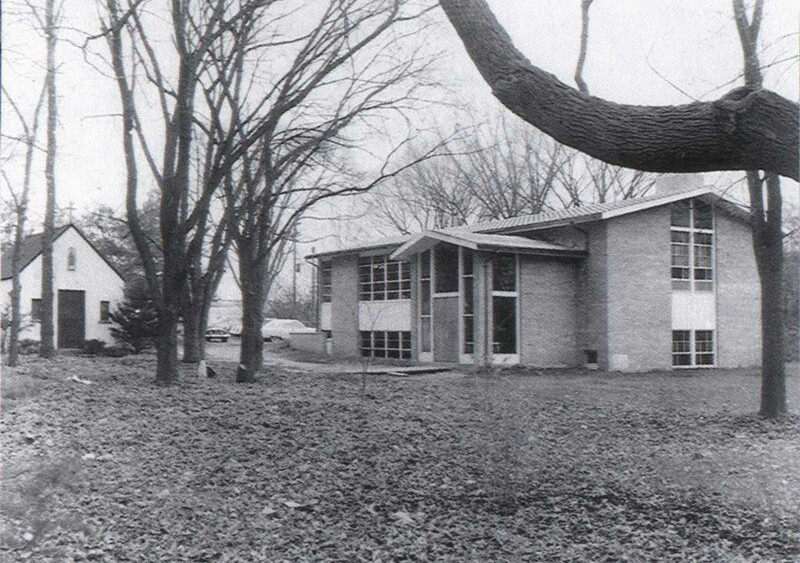 In 1965, as membership steadily grew, St. Clare’s was designated as a parish church, and with pledges from its congregation and a loan from the Diocese of Michigan, completed construction in September 1968 of a church building with a spacious sanctuary-in-the-round, office space and Church School classrooms. By the end of the decade, St. Clares was holding three Sunday services (including a folk music service), publishing the St. Clarian parish newsletter each month, and focused on renewed ministry and mission. The parish was involved in the issues of the times, with a parish-wide program on Christian social justice. 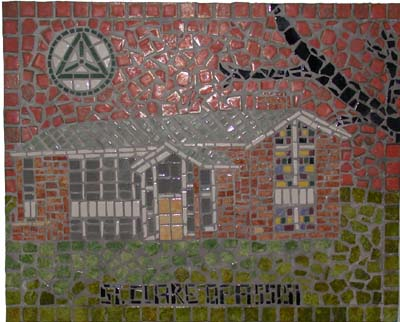 Other programs focused on the Detroit city race riots, disarmament and peace, and national and local politics. In 1970, Temple Beth Emeth, a local Reform Jewish congregation, began to rent space from St Clare’s. By 1972, given the continued use of the sanctuary by Beth Emeth, a St. Clare’s parishioner engineered a way for the cross behind the altar to rotate out of sight during Temple services. In 1972, the Rev. Campbell resigned to take a position as rector at St. Mark’s in Palo Alto, California, and the Rev. Douglas Evett accepted the call as rector later that year. 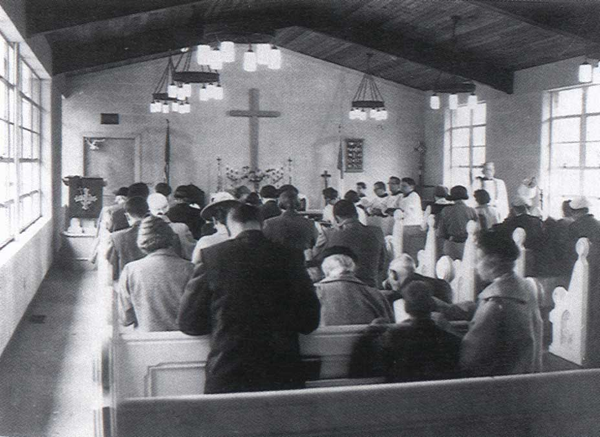 In 1974, at separate congregational meetings, each congregation voted to approve the concept of joint ownership of a co-designed and renovated facility. To do this, in December, St. Clare’s and Temple Beth Emeth signed an agreement that created a nonprofit corporation, known as Genesis of Ann Arbor. The agreement provided that all property (with the exception of Wisdom House and the Chapel) was to be owned and supervised by Genesis. A Genesis Board of Directors was established. As part of this agreement, the Temple Beth Emeth undertook raising funds for and building an expanded classroom building. In 1975, the Star of David and the cross were erected side by side outside the sanctuary, fronting Packard Road, and “Genesis” was dedicated formally on May 31. 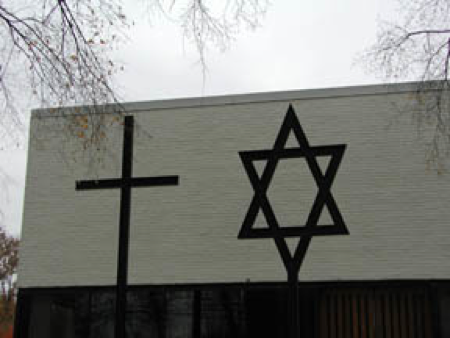 The cross and Star of David stand side-by-side in front of the church In 1978, St. Clare’s celebrated its 25th anniversary, and on Whitsunday, 1978, St. Clare’s dedicated the 22 needlepoint cushions encircling the altar. The theme for these cushions is that God as Creator and Father and as Incarnate Lord lives, as Holy Spirit, within this community of St. Clare’s and within the lives of individual Christians. Each cushion tells a unique story, but the overall design incorporates two unifying motifs: the links of the chain binding Christians together and the rays of light emanating from the altar in the form of a Maltese cross spanning out from the altar to the cushions. Click on the picture below to see all the cushions and the story that they tell. The 22 needle point cushions placed around the altar tell the story of God’s Creation. During the 1980s, the parish expanded steadily in both members and financial resources. By 1983, the parish had 153 pledging units. The decade saw the first female baby Jesus in the Christmas pageant, and the calling of St. Clare’s first female clergy, the Rev. Susan Bock, in 1989. 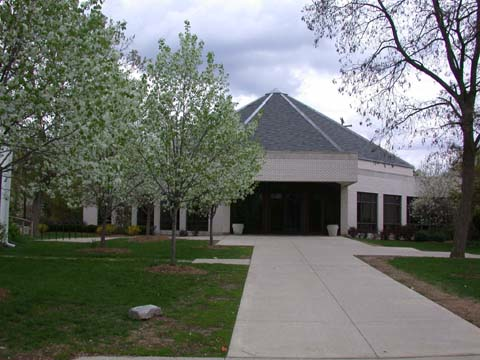 By the last years of the decade, it was becoming apparent that our facility was too small to accommodate the growing needs of St. Clare’s and Temple Beth Emeth and both congregations started exploring options for future growth. At a special parish meeting in March 1990, the congregation identified ministry, the Church School program, music, outreach and worship as the activities that defined St. Clare’s. The challenge facing the parish was how to integrate these key activities with the congregations’ growing need for space. At a second parish meeting in June, the parish resolved to reaffirm St. Clare’s relationship with the Temple as a “vital expression of our personal and collective ministry,” and to embark on a joint capital campaign with TBE to expand our facility to provide a larger sanctuary and social hall as well as additional classroom space. This facility, which we now occupy, was completed and dedicated by St. Clare’s on September 11, 1994. In 2000, we celebrated the 25th anniversary of Genesis with special commemorations throughout the year. 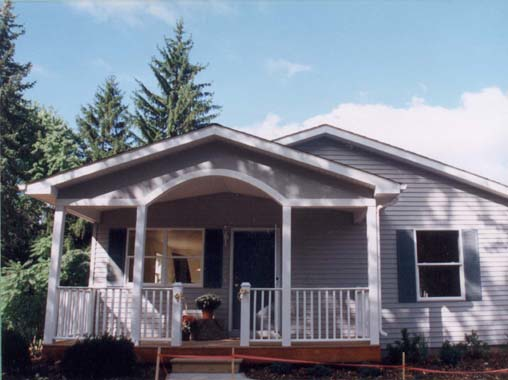 One cornerstone of this celebration was the building of the Genesis Habitat for Humanity House, a joint activity undertaken by the congregations of St. Clare’s and Temple Beth Emeth. Additionally in 2000, St. Clare’s began an endowment fund. At the end of the service, every member of both congregations was asked to sign the wall. Following the wall signing and a picnic, both congregations attended a concert given by Gemini. In January 2001, Mr. Evett ended his 27-year tenure as rector of St. Clare’s. The Reverend Bryant Dennison, a long-time friend of St. Clare’s parish, served as Interim Rector. During the search period, both the quantitative information and the answers to the open-ended questions from a parish survey pointed to a congregation deeply committed to St. Clare’s because of the sense of community, the style of worship/liturgy, its music, and the opportunities for spiritual growth. The relationship with the Temple, the acceptance of diversity in thought, the active role of children and lay people, as well as clergy and staff, were other facets of the parish that respondents singled out as highly valued attributes of St. Clare’s. In all, there was a strong sense of hope and eagerness as parishioners looked forward to their future together. In July 2003, the Vestry and Search Committee jointly announced that St. Clare’s had a new rector. The Rev. James Rhodenhiser and his family joined us in September 2003. James Rhodenhiser was formerly rector of Church of the Good Shepherd in Salinas, California.